At the end of the day, the result of CSNTM’s labors is a website, and the central feature of that website is our manuscript library. At the time of writing this, we currently have images of or links to more than 1500 manuscripts in our library. About half of these were produced by CSNTM since our founding in 2002. Before proceeding, I first want to note that we recognize that our online library is useful to far more people than just textual scholars. A natural goal of CSNTM is to benefit those in our direct line of work, which is contributing to future editions of the Greek New Testament. However, we know and are glad that our website is useful for art historians, codicologists, paleographers, professors, students, pastors, and just those interested in the historical documents of Christianity. The most recognizable benefit of a digital library is access to the manuscripts. It was not that long ago that if you were interested in seeing what a manuscript contained, you had to travel to that library or monastery to see it. Naturally, this was prohibitively expensive for almost everyone and does not account for all of the issues involved in contacting the holding institutions and being granted access to see the manuscript. With an online library of images, anyone anywhere in the world can quickly access the images of any manuscript they want to see. 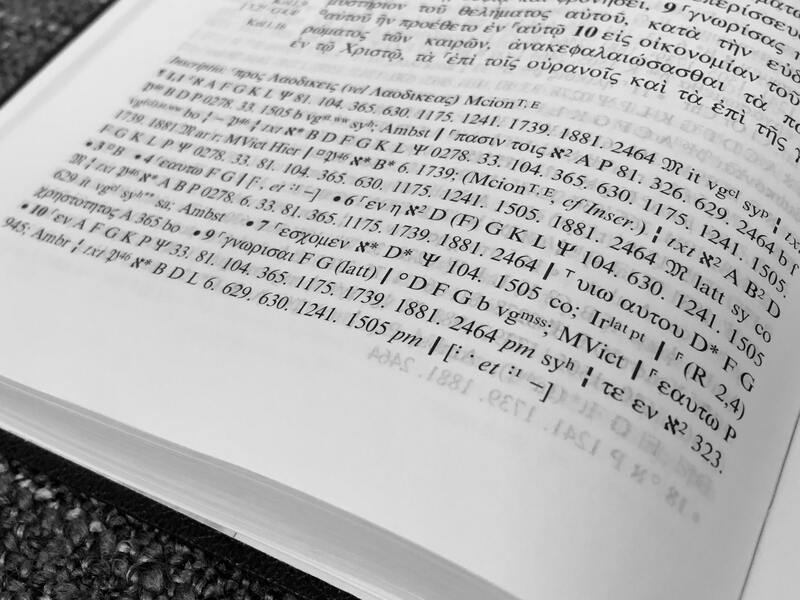 Additionally, a fully-tagged library of images (which is what CSNTM is working towards) allows users to find every instance of certain features, such as icons of Mark, or to consult every instance of Romans 1.1 in the manuscript tradition. This latter point relates to a second benefit of an online library, which is the ability to consult the actual manuscripts versus the abstract presentation of the data in a critical apparatus. Seeing the actual manuscripts allows scholars to confirm the data in the apparatus, which can be incorrect at times, and serves a pedagogical purpose for professors wanting to make textual criticism more tangible and exciting for their students. It is beneficial any time instructors can shift their students from thinking of manuscripts as numerical data to thinking of them as historical artifacts. Images help make that shift in ways the critical apparatus, transcriptions, and collations cannot. Continuing with the benefit of being able to confirm details in an apparatus, an online library of high-resolution images offers one the ability to clarify details in the manuscripts that might have been obscured by lower-resolution images. It’s just a small example, but the fuzziness and darkened ink in the following microfilm led one scholar to assume there was a correction present. A microfilm image (top) and CSNTM's digital image (bottom) of GA 69. However, the sharpness of CSNTM’s high-resolution images makes it clear that there is no correction present and that the darkness of the ink is just the result of the scribe re-inking his pen. These kinds of fine details are only accessible when we have excellent images to consult. When CSNTM was founded, the primary goal was to preserve and make manuscripts available to anyone who wanted access anywhere in the world. We have been around for 16 years now, and the reach of the organization is greater than I think anyone could have initially conceived. We are glad that so many thousands of users each year find our website helpful for their research, studies, or to satisfy their own personal curiosity. As we look to the future, we are excited about continually adding to our online library and, perhaps most importantly, making all of these resources available for free.